Rocks are silent storytellers: because each mineral is created only under certain conditions, they provide insight into the evolution of the body on which they are found. Scientists from the Max Planck Institute for Solar System Research (MPS) in Germany have now begun to tell such a story from the enigmatic dark material discovered on the protoplanet Vesta. Using data from the framing camera aboard NASA’s Dawn spacecraft, the researchers have succeeded for the first time in identifying a mineral component of this material: serpentine. The new discovery puts an end to the discussion about the origin of the dark material: impacts of primitive asteroids must have distributed it on Vesta. 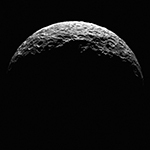 The protoplanet Vesta has been witness to an eventful past: images taken by the framing camera onboard NASA’s space probe Dawn show two enormous craters in the southern hemisphere. The images were obtained during Dawn’s year-long visit to Vesta that ended in September 2012. 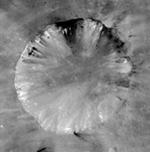 These huge impacts not only altered Vesta’s shape, but also its surface composition. Scientists under the lead of the Max Planck Institute for Solar System Research (MPS) in Germany have shown that impacting small asteroids delivered dark, carbonaceous material to the protoplanet. In the early days of our solar system, similar events may have provided the inner planets such as Earth with carbon, an essential building block for organic molecules. These results were published in the November-December issue of the journal Icarus. Like a movie star constantly retouching her makeup, the protoplanet Vesta is continually stirring its outermost layer and presenting a young face. New data from NASA’s Dawn mission show that a common form of weathering that affects many airless bodies like Vesta in the inner solar system, including the moon, surprisingly doesn’t age the protoplanet’s outermost layer. The data also indicate that carbon-rich asteroids have been splattering dark material on Vesta’s surface over a long span of the body’s history. Over time, soils on the moon and on asteroids have undergone extensive weathering. Scientists see this in the accumulation of tiny metallic particles containing iron, which dulls the bright, fluffy outer layers of these bodies. Yet Dawn’s visible and infrared mapping spectrometer (VIR) and framing camera detected no accumulation of these tiny particles on Vesta, and the protoplanet (sometimes called a giant asteroid) remains bright and pristine.